A camel ended up getting loose and running wild at a circus in Pittsburgh on Sunday, dragging one rider on a harrowing experience and injuring six children. The six children suffered minor injuries, though one broke their arm, officials said. An adult also suffered a minor injury in the incident. The camel was apparently spooked during a mid-show event by the Shrine Circus at PPG Paints Arena in which guests are invited down to the floor to see the circus animals up close and even ride some of them, including camels, according to Pittsburgh ABC affiliate WTAE. "We've had the circus for 69 years without incident," Shrine Circus Chairman Paul Leavy told WTAE. "Unfortunately this is the first one and we are ready to handle things like this, we are insured for this, so we'll get back together and see what we're going to do next year." The rides continued after the camel was corralled and the second half of the circus went on as planned. "I was like, 'This happens everywhere else, not here,'" eyewitness Michelle Cioppa said. "It was like it was not even real. It was just the craziest thing." A camel got loose and injured seven people, including six children, at the Shrine Circus in Pittsburgh on Sunday, Sept. 16, 2018. 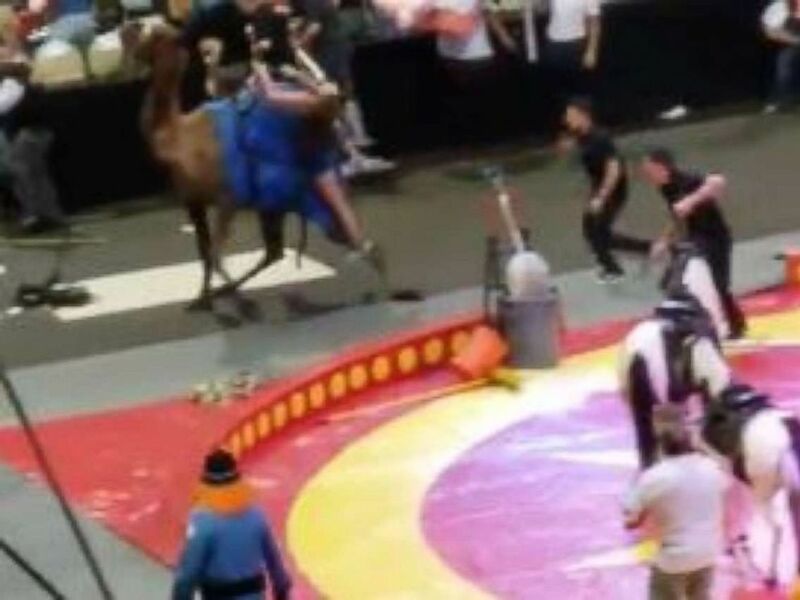 Video shot by an attendee showed the camel bucking as it traversed the crowded arena floor with a rider clinging to its back and two handlers chasing after it. It's unclear if the rider was one of those injured in the incident. People on the floor can be seen scrambling to avoid the animal before handlers brought it under control after about 10 seconds. An announcer in the arena can be heard saying, "Ladies and gentleman remain calm," as parents hurriedly ushered children from the floor. "Praying for the little girls at the circus and the mother that was traumatizing," Ronald Smith, who shot the video, wrote on Facebook. "My first and last time going to a circus."